"Heart of America," "Paris of the Plains"
Kansas City is the largest city in the state of Missouri. It encompasses 318 square miles (824 sq km) in parts of Jackson, Clay, Cass, and Platte counties. 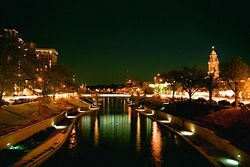 The city also serves as the anchor city of the Kansas City Metropolitan Area, second largest metro area in Missouri and largest with territory in Kansas, though Wichita is the largest metro anchored in Kansas. As of 2006, the city had an estimated population of 447,306, with a metro area population of nearly two million. Kansas City was founded in 1838 as the "Town of Kansas" at the confluence of the Missouri and Kansas rivers and was incorporated in its present form in 1850. Situated opposite Kansas City, Kansas, the city was the location of several battles during the Civil War, including the Battle of Westport. Kansas City, nicknamed the "City of Fountains," is well known for its contributions to the musical styles of jazz and blues as well as for its famous Kansas City-style barbecue. Kansas City, Missouri is often abbreviated as "KCMO," or simply "KC," with both abbreviations often referring to the city's entire metropolitan area. Though the area was a hotbed of violence in the days leading to the Civil War, experiencing what was called the "Border Wars" (or Bleeding Kansas), the city's larger metropolitan area today sits in both states; the border barely more than a narrow street. Kansas City lies near the geographic center of the contiguous United States, at the confluence of the second largest river in the country, the Missouri River, and the Kansas River (also known as the Kaw River). According to the United States Census Bureau, the city has a total area of 318.0 square miles (823.7 sq km). Of this, 313.5 sq miles (812.1 km²) are land, with the remaining 4.5 sq mi (11.6 km²) of it water. A city of rolling hills, much of urban Kansas City sits atop 100-200 foot bluffs overlooking the rivers and river bottoms areas. Kansas City proper is bowl-shaped and is surrounded to the north and south by glacier-carved limestone and bedrock cliffs. The area upon which Kansas City is built is situated at the junction between the Dakota and Minnesota ice lobes during the maximum late Independence glaciation of the Pleistocene epoch. The Kansas and Missouri rivers cut wide valleys into the terrain when the glaciers melted and drained. A partially filled spillway valley crosses the central portion of the city. This valley is an eastward continuation of Turkey Creek valley. The city's renovated (1996) Union Station is located here. The city's tap water was recently rated the cleanest among the 50 largest cities in the United States, containing no detectable impurities. The Kansas City area lies in an area of humid continental climate (Koppen climate classification Dfa) with moderate precipitation and extremes of hot and cold. Summers can be very humid, with moist air riding up from the Gulf of Mexico, and during July and August daytime highs often reach into the triple digits. Winters vary from mild days to bitterly cold, with lows reaching into the teens below zero a few times a year. Spring and autumn are pleasant and peppered with thunderstorms. Kansas City is situated in "Tornado Alley," a broad region where cold air from the Rocky Mountains and Canada collides with warm air from the Gulf of Mexico, leading to the formation of powerful storms. The region is also prone to ice storms, such as the 2002 ice storm during which hundreds of thousands lost power for days and (in some cases) weeks. Kansas City and its outlying areas are also subject to flooding, and were hit by both the Great Flood of 1993 and the Great Flood of 1951. 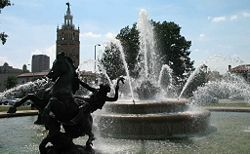 Officially nicknamed the City of Fountains, Kansas City has over 200 listed fountains, with more, both public and private, added regularly. The city claims to have the second most in the world, just behind Rome. It is said that the city's love-affair with water has to do with the importance of water to the city's birth at the confluence of the Missouri and Kansas Rivers. The city also has more boulevards than any city except Paris and has often been called by locals "Paris on the Plains." Fountains and boulevards, statues, trees and gardens that run throughout the city all combine to make it one of the country's most beautiful cities. Kansas City is well-known for its spacious parkways and numerous parks. The parkway system winds its way through the city with broad, landscaped medians that include statuary and fountains. One of the best examples is Ward Parkway on the west side of the city, near the Kansas state line. Originally designed for aesthetics and minor automobile/horse and buggy traffic, many parkways were drastically altered to accommodate more and more vehicles, becoming minor freeways. Swope Park is one of the nation's largest in-city parks, comprising 1,763 acres (2.75sq mi), more than twice as big as New York's Central Park. It includes a full-fledged zoo, two golf courses, a lake, an amphitheatre, day-camp area, and numerous picnic grounds. Kansas City has always had an excellent urban forestry program. At one time, almost all residential streets were planted with a solid canopy of American elms, but Dutch elm disease devastated them. Most of the elms died and were replaced with a variety of other shade trees. A program is underway to replace many of the fast-growing sweetgum trees with hardwood varieties. A number of Kansas City's 150 neighborhoods have histories as independent cities or the sites of major events. Not far from the downtown area, the urban core of the city has a variety of neighborhoods, including historic Westport, the Crossroads Arts District, 18th and Vine Historic District, Pendleton Heights, Quality Hill, the West Bottoms and the River Market. Crown Center is the headquarters of Hallmark Cards and a major downtown shopping and entertainment complex. It is connected to Union Station by a series of covered walkways. The Country Club Plaza, or simply "the Plaza," is an upscale, outdoor shopping and entertainment district. It was the first shopping district in the United States designed to accommodate shoppers arriving by automobile, and is surrounded by apartments and condominiums, including a number of high rise buildings. The associated Country Club District to the south includes the Sunset Hill and Brookside neighborhoods, and is traversed by Ward Parkway, a beautiful, landscaped boulevard known for its statuary, fountains and large, historic homes. Kansas City's Union Station, which was renovated in 1996, is home to Science City, restaurants, shopping, theaters, and the city's Amtrak facility. 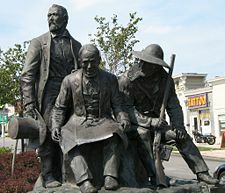 Kansas City Pioneer Square monument in Westport neighborhood features Pony Express founder Alexander Majors, Westport/Kansas City founder John Calvin McCoy and Mountainman Jim Bridger. The first documented European visit to Kansas City was Étienne de Veniard, Sieur de Bourgmont. In 1714 he penned "The Route to Be Taken to Ascend the Missouri River." In the document he described the junction of the "Grande Riv[iere] des Cansez" and Missouri River, being the first to refer to them by those names. French cartographer Guillaume Delisle used the descriptions to make the first reasonably accurate map of the area. Following the Louisiana Purchase of 1803, Lewis and Clark visited the confluence of the Kansas and Missouri rivers, noting it as a "good location to build a fort." The Chouteau family operated under the Spanish license at St. Louis in the lower Missouri Valley as early as 1765, but it would be 1821 before the Chouteaus reached the Kansas City area, when François Chouteau established Chouteau's Landing. Missouri joined the Union in 1821 and, after the Treaty of St. Louis in 1825, the 1,400 Missouri Shawnees were forcibly relocated from Cape Girardeau to southeastern Kansas, close to the Neosho River. In 1826, the Prophet Tenskwatawa established a village in Argentine, Kansas (now a neighborhood within Kansas City, Kansas). During 1833, only the Black Bob's band of Shawnee resisted the relocation efforts. They settled in northeastern Kansas near the town of Olathe (now a suburb on the Kansas side of the KC metropolitan area) and along the Kaw River in Monticello near Gum Springs. Tenskwatawa died in 1836 at his village in Kansas City, Kansas. The White Feather Spring marker notes the location. The Whitefeather Spring marker, near the grave of Shawnee prophet, Tenskwatawa. In 1833 John McCoy established West Port along the Santa Fe Trail, three miles from the river. Then in 1834, McCoy established Westport Landing on a bend in the Missouri River to serve as a landing point for West Port. Soon after, the Kansas Town Company, a group of investors, began to settle the area, taking their name from an English spelling of "Cansez." In 1850 the landing area was incorporated as the Town of Kansas. By that time, the Town of Kansas, Westport, and nearby Independence, had become critical points in America's westward expansion. Three major trails—the Santa Fe, California, and Oregon—all originated in Jackson County. On February 22, 1853, the City of Kansas was created with a newly elected mayor. It had an area of less than one square mile and a population of 2,500. The area was rife with animosity as the Civil War approached. As citizens of a slave state, Missourians tended to sympathize with the southern states. With Kansas, directly to its west, petitioning to enter the Union under the new doctrine of popular sovereignty, many from the area crossed into Kansas to sway the state towards allowing slavery, first by ballot box and then by bloodshed. During the Civil War, the City of Kansas was in the midst of battles, almost all of them victories by the Union. The Battle of Independence in August 1862 stunted a Confederate advance into northern Missouri (settled by pro-slavery Virginians), and the October 1864 Battle of Westport effectively ended Confederate efforts to occupy the city. Moreover, General Thomas Ewing—in response to a successful raid on nearby Lawrence, Kansas, led by William Quantrill—issued General Order No. 11, forcing the eviction of residents in four western Missouri counties, including Jackson, except those living in the city and nearby communities and those whose allegiance to the Union was certified by Ewing. After the Civil War, the City of Kansas grew rapidly. The selection of the city over Leavenworth, Kansas, for the Hannibal & St. Joseph Railroad bridge over the Missouri River brought about significant growth. The population exploded after 1869, when the Hannibal Bridge, designed by Octave Chanute, opened. The boom prompted a name change to Kansas City in 1889 and the city limits to extend south and east. Westport became part of Kansas City on December 2, 1897. 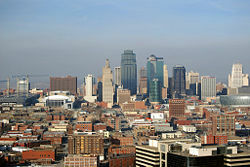 According to the U.S. Census in 1900, Kansas City was the 22nd largest city in the country, with 163,752 residents. Kansas City, guided by architect George Kessler, became a forefront example of the City Beautiful movement, developing a network of boulevards and parks around the city. 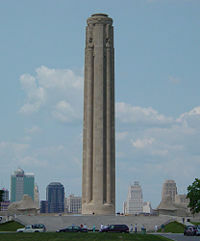 The relocation of Union Station to its current location in 1914 and the opening of the Liberty Memorial in 1923 gave the city two of its most identifiable landmarks. Further spurring Kansas City's growth was the opening of the innovative Country Club Plaza development by J.C. Nichols in 1925 as part of his Country Club District plan. At the turn of the century, political machines attempted to gain clout in the city, with the one led by Tom Pendergast emerging as the dominant machine by 1925. A new city charter passed that year made it easier for his Democratic Party machine to gain control of the city council (slimmed from 32 members to nine) and appoint a corrupt city manager. Several important buildings and structures were built during this time, to assist with the Great Depression—all led by Pendergast, including the Kansas City City Hall and the Jackson County Courthouse—both added new skyscrapers to the city's growing skyline. The machine fell in 1939 when Pendergast, riddled with health problems, pleaded guilty to tax evasion. The machine, however, gave rise to Harry S. Truman, who quickly became Kansas City's favorite son. Union Station, with downtown Kansas City in the background, at twilight, 2004. Kansas City's expansion and the creation of suburbs originally began with the invention and implementation of streetcars into the city and the surrounding areas. Streetcar suburbs began to pop up and more and more detached, single family homes were built away from the main part of town. The city's first "Suburbs" were in the neighborhoods of Pendleton Heights and Quality Hill. However, the real sprawl and creation of suburbs didn't begin until after the Second World War. After World War II, the city experienced considerable sprawl, as the affluent populace left for suburbs like Johnson County, Kansas, and eastern Jackson County, Missouri. However, many also went north of the Missouri River, where Kansas City had incorporated areas between the 1940s to 1970s. The population of the urban core significantly dipped, while the city as a whole gained population. The sprawl of the city mainly took shape after the "race riots" of the Civil Rights Movement in Kansas City. At this time, slums were also beginning to form in the inner city, and those who could afford to leave, left for the suburbs and outer edges of the city. The post-WWII idea of suburbs and the "American Dream" also contributed to the spread of the area. As the city continued to expand outward, the inner city also continued to decline. In 1940, the city proper had about 400,000 residents; by 2000, the same area was home to only about 180,000. From 1940 to 1960, the city more than doubled its physical size, while increasing its population by only about 75,000. By 1970, the city had a total area of approximately 316 square miles (818.44 sq km), more than five times its size in 1940. Kansas City is home to the largest municipal government in the state of Missouri. The city has a city manager form of government, however the role of city manager has diminished over the years following excesses during the days of Tom Pendergast. The mayor is the head of the Kansas City City Council, which has 12 members (one member for each district, plus one at large member per district), and the mayor himself is the presiding member. Kansas City holds city elections on odd numbered years, every four years. Kansas City is the seat of the United States District Court for the Western District of Missouri, one of two federal district courts in the state (the other, the Eastern District, is in St. Louis). It also is the seat of the Western District of the Missouri Court of Appeals, one of three districts of that court (the Eastern District is in St. Louis and the Southern District is in Springfield). Kansas City has hosted the 1900 Democratic National Convention, the 1928 Republican National Convention, which nominated Herbert Hoover from Iowa for President, and the memorable 1976 Republican National Convention, which nominated Kansas U.S. Senator Bob Dole for Vice President. Kansas City consistently votes Democratic in Presidential elections, however on the state and local level Republicans often find some success, especially in the Northland and other parts of Kansas City that are predominately suburban. 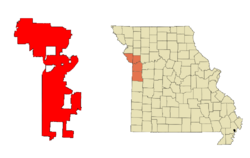 Missouri's 5th congressional district – all of Kansas City proper in Jackson County plus Independence and portions of Cass County. In 2008 represented by Emanuel Cleaver (Democrat). Missouri's Sixth Congressional District – all of Kansas City proper north of the Missouri River and plus suburbs in eastern Jackson County beyond Independence and a vast stretch of suburbs and rural areas extending more than 100 miles to the Iowa border. In 2008 represented by Sam Graves (Republican). Greater Kansas City is headquarters to four Fortune 500 companies (Sprint Nextel Corporation, H&R Block, Embarq Corporation, and YRC Worldwide Inc.) and additional Fortune 1000 corporations (Interstate Bakeries Corporation, Great Plains Energy,Aquila, AMC Theatres, and DST Systems). Hallmark Cards's gross revenues certainly would qualify it for both lists, but it cannot be included because it is privately owned by the Hall family. Numerous agriculture companies operate out of the city and the Kansas City Board of Trade is the principal trading center for hard red winter wheat—the principal ingredient of bread. Kansas City is literally "on the money." 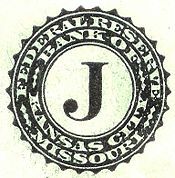 Bills issued by the Federal Reserve Bank of Kansas City are marked with the letter "J" and/or the number "10." The single dollar bills have Kansas City's name on them. Missouri is the only state to have two of the 12 Federal Reserve Bank headquarters, the other being in St. Louis. From its beginnings, Kansas City's location on the confluence of the Missouri and Kansas Rivers made it an important transportation hub. It was a launching point for travelers heading west: the Santa Fe, Oregon, and California trails began in the area. Today transportation plays a huge part in the economy of the Greater Kansas City area. With the construction of the Hannibal Bridge across the Missouri River it became the central location for 11 trunk railroads. More rail traffic in terms of tonnage passes through the city than any other city in the country. TWA located its headquarters in the city with ambitious plans to turn the city into an air hub for the world. The interstate highway system got its start in the states of Kansas and Missouri with the construction of Interstate 70. Interstate 435, which encircles the Kansas City metropolitan area in both states (Kansas and Missouri), is the second longest beltway in the nation. Today, Kansas City and its metropolitan area has more miles of limited access highway lanes per capita than any other large metro area in the United States, over 27 percent more than second-place Dallas/Fort Worth Metroplex, over 50 percent more than the average American metro area and nearly 75 percent more than the metropolitan area with the least: Las Vegas. The relatively uncongested freeway network contributes significantly to Kansas City's position as one of America's largest logistics hubs. Its meeting of three interstate highway systems (I-29, I-70, I-35 and soon I-49) and its geographical location in the center of the U.S. makes it an important location for distribution. Numerous corporations have built distribution facilities in the area, and more freight moves through Kansas City than any other city in the nation, earning it the nickname America's inland port. Kansas City International Airport was built to the specifications of TWA to make a world hub for the supersonic transport and Boeing 747. Its passenger friendly design in which its gates were 100 feet (30 m) from the street has, since the September 11, 2001 attacks, required a costly overhaul to retrofit it to incorporate elements of a more conventional security system. The airport is completely supported by user fees and receives no general fund support for operations. Charles B. Wheeler Downtown Airport was the original headquarters of Trans World Airlines and houses the Airline History Museum. It is still used for general aviation and airshows. Like most American cities, Kansas City's mass transit system was originally rail-based. An electric trolley network ran through the city until 1957. The rapid sprawl in the following years led to the closure of this system. Today's mass transit system cannot compare to those of the larger cities such as New York, Chicago, Los Angeles or Seattle. This is due in part to the large geographic area which the metropolitan area covers, as well as its easy, uncongested highway system. The Kansas City Area Transportation Authority (KCATA) was formed with the signing of a Bi-State compact created by the Missouri and Kansas legislatures on December 28, 1965. It is governed by a ten-member Board of Commissioners, five from the state of Kansas and five from the state of Missouri. The system honors "Ozone Alert!" days between June 1 and September 30, on which the fares are reduced by more than 50 percent in order to encourage mass transit over individual vehicle usage. Some of the earliest violence in Kansas City erupted during the American Civil War. Shortly after the city's incorporation in 1850, the period which has become known as Bleeding Kansas erupted, affecting border ruffians and Jayhawkers, who both lived in the city. During the war, Union troops burned all occupied dwellings in Jackson County south of Brush Creek and east of Blue Creek to Independence in an attempt to halt raids into Kansas. After the war, The Kansas City Times editor John Newman Edwards turned outlaw Jesse James into a folk hero through his coverage. James was born in the Kansas City metro area at Kearney, Missouri, and notoriously robbed the Kansas City Fairgrounds at 12th Street and Campbell Avenue, among a multitude of other locations. 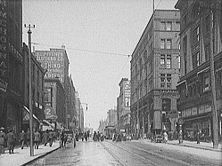 In the early twentieth century under Democratic political "Boss" Tom Pendergast, Kansas City became the country's "most wide open town," with virtually no enforcement of prohibition. While this would give rise to Kansas City Jazz, it also led to the rise of the Kansas City mob (initially under Johnny Lazia), as well as the arrival of organized crime. The 1930s saw the Kansas City Massacre at Union Station, as well as a shootout between police and outlaws Bonnie and Clyde at the Red Crown Tavern near what is now Kansas City International Airport. In the 1970s, the Kansas City mob was involved in a gangland war over control of the River Quay entertainment district, in which three buildings were bombed and several gangsters were killed. Police investigations into the mob took hold after boss Nick Civella was recorded discussing gambling bets on Super Bowl IV (in which the Kansas City Chiefs defeated the Minnesota Vikings). The war and investigation would lead to the end of mob control of the Stardust Casino, which was the basis for the film Casino (although the Kansas City connections are minimized in the movie). According to the Morgan Quitno Press for the year 2007, Kansas City ranked 16th on the Federal Bureau of Investigation's annual survey of crime rates for all cities, regardless of population. It ranked sixth in the rate of murders in that group's 2006 survey. The entire Kansas City metropolitan area has the fourth worst violent-crime rate among cities with more than 100,000, with a rate of 614.7 violent crimes per 100,000 residents.. On the other hand, many of the surrounding cities in the Kansas City Metropolitan Area reflect the opposite in crime statistics. Much of the city's murders and violent crimes occur in the city's inner core. The violent crime rates in the core consistently have driven the city and metropolitan area down on "livability" indices, hindering initiatives in the 1970s, 1980s and 1990s to revive downtown Kansas City. In the 2000s, however, attempts at revitalizing the downtown area have been more successful. The downtown neighborhood currently has one of the lowest crime rates in the urban core, prompting revitalization of the area, including new lofts, a new entertainment district and a new arena. According to an analysis by The Kansas City Star and the University of Missouri at Kansas City, downtown has experienced the largest drop in crime of any neighborhood in the city during the current decade. In 2007, Worldwide ERC and Primary Relocation recognized Kansas City third overall as one of the "Best Cities for Relocating Families" in the United States. Also in March 2007, Money Magazine rated Overland Park, Kansas, 6th best city to live in the United States. Neighboring city Olathe, Kansas, was rated 13th and Lee's Summit, Missouri, 44th best. Kansas City is one of two metro areas to have two cities in the top fifteen. Though these analyses include the entire metropolitan area, they are an important indicator of the realistic situation of life in and around Kansas City. Kansas City has long been praised for its varied architecture. 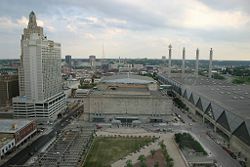 Its skyline is notable for various structures, including the immense Bartle Hall Convention Center, the adjoined art deco Municipal Auditorium, and numerous skyscrapers such as the Kansas City Power and Light Building and One Kansas City Place (the tallest habitable structure in the state), as well as the KCTV-Tower (the tallest freestanding structure in Missouri and 31st tallest tower in the world). It is also home to the Liberty Memorial, the National World War I Memorial of the United States which houses the The National World War I Museum, as designated by the U.S. Congress in 2004. Kansas City offices of significant national and international architecture firms include ACI/Boland, BNIM, 360 Architecture, Ellerbe Becket, HNTB and HOK Sport. With more than 200 fountains, Kansas City claims that only Rome has more fountains. A fountain is the logo for the city and "City of Fountains" is an official nickname. The densest and most famous area for fountains is the Country Club Plaza. Many smaller fountains dot the street scape throughout the district. Arthur Bryant's Barbecue in the inner-city is visited by U.S. Presidents and celebrities. Kansas City is famous for two specialties; strip steak and barbecue. During the heyday of the city's stockyards, it became famous for "Kansas City Strip Steaks." The most famous of the steakhouses is the Golden Ox in the Kansas City Live Stock Exchange in the stockyards in the West Bottoms. The stockyards, which were second only to those of Chicago in size, never recovered from the Great Flood of 1951 and eventually closed. The famed Kansas City Strip cut of steak is largely identical to the New York Strip cut, and is sometimes referred to just as a strip steak. Nationally famous for its barbecue, it is often dubbed the "barbecue capital of the world." There are more than 90 barbecue restaurants in the metropolitan area. The American Royal (an annual livestock, horse and rodeo show) each fall hosts the world's largest barbecue contest. The classic Kansas City-style barbecue was an inner city phenomenon that evolved from the pit of Henry Perry from the Memphis, Tennessee area in the early 1900s and blossomed in Kansas City's famed 18th and Vine neighborhood. Arthur Bryant's took over the Perry restaurant and amended the recipe. In 1946 Gates and Sons Bar-B-Q was opened by one of Perry's cooks. The Gates recipe was amended further. Although Bryant's and Gates are the two definitive Kansas City barbecue restaurants, they have just recently begun expanding outside of the Greater Kansas City Area. In 1977 Rich Davis, a psychiatrist, test-marketed his own concoction called K.C. Soul Style Barbecue Sauce. He renamed it KC Masterpiece and in 1986 he sold the sauce to the Kingsford Company. Davis retained rights to operate restaurants using the name and sauce, with a restaurant in the suburb of Overland Park, Kansas. Scout Indian statue in Seville, sistered with Kansas City. Kansas City has an almost identical statue in Penn Valley Park, near the Liberty Memorial that is pointing in the direction of Seville. 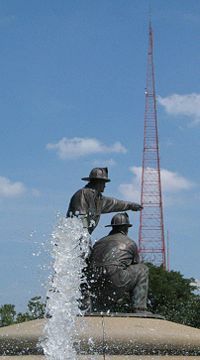 KCTV Tower on 31st Street on Union Hill in Kansas City, with the Firefighters' Memorial Fountain in the foreground. Kansas City is home to the Kansas City Symphony, founded by R. Crosby Kemper Jr. in 1982 to supersede the Kansas City Philharmonic, which had existed since 1933. The symphony currently is located at the Lyric Theatre in Downtown Kansas City, but is slated to move to the new Kauffman Center for the Performing Arts, also downtown, when it is completed in December of 2009. The current music director and lead conductor of the symphony is the world-renowned Michael Stern. The Lyric Opera of Kansas City, founded in 1970, is one of the nation's premier regional opera companies. It prides itself on offering one American contemporary opera production during its annual season consisting of either four or five productions. Originally, all operas were performed in English, although in the late-1990s the company decided to perform all productions in their original languages. The Lyric Opera also is located at the Lyric Theatre, and also will move to the Kauffman Center for the Performing Arts upon its completion. The Kansas City Ballet, founded in 1957 by Tatiana Dokoudovska, is a ballet troupe comprising 25 professional dancers and apprentices. Between 1986 and 2000, it was combined with Dance St. Louis to form the State Ballet of Missouri, although it remained in Kansas City. From 1980 to 1995, the Ballet was run by renowned dancer and choreographer Todd Bolender. Today, the Ballet offers an annual repertory split into three seasons which ranges from classical to contemporary ballets. The Ballet also is located at the Lyric Theatre, and also will move with the Symphony and Opera to the Kauffman Center in 2009. Kansas City Jazz in the 1930s marked the transition from big bands to the bebop influence of the 1940s. In the 1930s City Boss Tom Pendergast was at the height of his power and left Kansas City a wide open town in which night clubs were allowed to remain open from dusk to dawn. In this venue, an era of musical improvisation developed in which it was not uncommon for a single "song" to be performed all night by competing performers who passed through the city. The era ended in 1936 when producer John H. Hammond began signing Kansas City talent and transferring the acts to New York City. The era of Kansas City influence is bracketed by the signing of Count Basie in 1929 to the advent of Kansas City native Charlie Parker in the 1940s. Pendergast pleaded guilty to income tax evasion in 1939 and the city soon began a crackdown of the clubs. In the 1970s Kansas City attempted to resurrect the glory of the jazz era in a sanitized family friendly atmosphere. An effort to open jazz clubs in the River Quay area of City Market along the Missouri ended in a gangland war in which three of the new clubs were blown up in what ultimately resulted in the removal of Kansas City mob influence in the Las Vegas casinos that was partially depicted in the movie Casino. In 1981, 114 people died in the Hyatt Regency walkway collapse at a tea dance that was attempting to recreate the jazz era. In 1999 the American Jazz Museum opened in the 18th and Vine neighborhood. Kansas City's local music scene enjoyed a revival which began in the mid-1960s, based around rock and blues in addition to jazz. Live music venues can be found throughout the city, with the highest concentration in the Westport entertainment district centered on Broadway and Westport Road near the Country Club Plaza. More recently, punk and hip-hop acts have been popular. 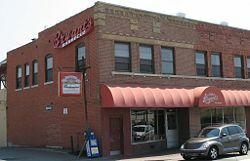 In addition, The New York Times declared nearby Lawrence, Kansas "the most vital music scene between Chicago and Denver" in a travel column dated February 25, 2005. In 1995, Kansas City hosted the first ever national improv festival, 'Spontaneous Combustion: The US Improv Festival'. Since then, similar improv festivals have popped up all over the country, most notably, the Chicago Improv Festival. This festival's current incarnation is called KCiF: The Kansas City Improv Festival. In 2004, The City 3 Project: Kansas City's Improv Community was launched in order to facilitate further growth of the art of improv in Kansas City. Since that time, the number of improv troupes in the metro area has tripled and new comedy theaters have opened. 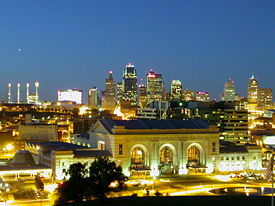 Major troupes in Kansas City in 2008 include Comedy City, Improv-Abilities, Full-Frontal Comedy, and The Trip Fives. The Kansas City Star 's printing plant opened in June 2006. The Star headquarters is the red brick building on the lower right. The Kansas City Star is the area's primary newspaper. William Rockhill Nelson and his partner, Samuel Morss, first published the evening paper on September 18, 1880. The Star competed heavily with the morning Times before acquiring it in 1901. The "Times" name was discontinued in March 1990, when the morning paper was renamed the "Star." Weekly newspapers include The Call, a newspaper with an African-American focus, and several weekly papers, including the Kansas City Business Journal, The Pitch and the bilingual paper Dos Mundos. The city is served by two major faith-oriented newspapers: The Kansas City Metro Voice, serving the Christian community, and the Kansas City Jewish Chronicle, serving the Jewish community. The Kansas City media market (ranked 29 by Arbitron and 31 by Nielsen) includes ten television channels along with 30 FM and 21 AM radio stations. Kansas City has served as a stepping stone for many national broadcasters including Walter Cronkite, Rush Limbaugh, and Mancow Muller. Sprint Center open house, October 10, 2007. Kansas City is often the home of the Big 12 College Basketball Tournaments. Men's Basketball will be played at Sprint Center beginning in March 2008, while women's Basketball will be played at Municipal Auditorium. Lately, arenas in Dallas and Oklahoma City have hosted the tournament. Arrowhead Stadium serves as the venue for various intercollegiate football games. Often it is the host of the Big 12 Football Title Game. On the last weekend in October, the Fall Classic rivalry game between Northwest Missouri State University and Pittsburg State University takes place here. Usually, the Bearcats of Northwest and Gorillas of Pitt State are ranked one-two in the MIAA conference. In 2005, other games at Arrowhead included Arkansas State playing host to Missouri, and Kansas hosting Oklahoma. National World War I Museum of the United States. Irish Museum and Cultural Center located in Kansas City's Union Station. Battle of Westport, one of the major battles of the American Civil War . Country Club Plaza, first shopping center designed to accommodate the automobile. Laugh-O-Gram Studio, Walt Disney's original cartoon studio in Kansas City. Now being renovated. Kansas City Zoo and Starlight Theatre, located in Swope Park. ↑ James S. Aber. February 2005. Glacial Geology of the Kansas City Vicinity Kansas City geology. Retrieved May 16, 2008. ↑ Robert Bruce. Kansas City Missouri Kansas City Missouri Church of God. Retrieved May 16, 2008. ↑ Matt Stearns, February 1, 2002. [KC powerless as icy barrage pummels the area, leaves behind disaster zone Kansas City Star. Retrieved May 16, 2008. ↑ Kansas City Convention & Visitors Association. March 30, 2006. ‘City of Fountains’ Indeed Retrieved May 16, 2008. ↑ City of Kansas City, Mo. Timeline 150 Retrieved May 17, 2008. ↑ City of Kansas City, Mo. Tri-Blenheim Neighbors United Retrieved May 17, 2008. ↑ Sherrie Kline Smith. April 2006. Why is Kansas City located in Missouri instead of Kansas? Kansas City Public Library. Retrieved May 17, 2008. ↑ US CensusRetrieved October 17, 2008. ↑ United States Department of Transportation. What was the first Interstate? Retrieved May 18, 2008. ↑ Chris Gutierrez. Shipping Central Commercial Journal - Kansas City. Retrieved May 18, 2008. ↑ Morgan Quitno Awards. 25 Safest Cities Retrieved May 17, 2008. ↑ Jeffery Spivak and Christine Vendel. December 22, 2007. Crime falls downtown and across much of Kansas City Downtown Council. Retrieved May 17, 2008. ↑ CNN Money Magazine. Best Places to Live 2006 Retrieved May 20, 2008. ↑ Experience Kansas City. Barbecue Kansas City Style Retrieved May 17, 2008. ↑ Deborah Jowitt. March 18th, 2008. Kansas City Ballet: Happy Fiftieth!. The Village Voice. Retrieved May 20, 2008. ↑ 'The Call Newspaper. The Call Retrieved May 20, 2008. Dorsett, Lyle W. 1968. The Pendergast Machine. New York: Oxford University Press. Experience Kansas City. Experience Kansas City Retrieved May 20, 2008. On Board LLC. Kansas City, Missouri Retrieved May 20, 2008. History of "Kansas City, Missouri"
This page was last modified on 11 April 2018, at 15:41.